1974 Pioneering Pamphlet Revision with Some Vintage Action Photos! Though there have been some changes and modifications through the years, in most respects, pioneering in the Boy Scouts remains constant. Why Pioneering! Crossing a Stream on an X-frame Monkey Bridge! Remember Robinson Crusoe? He was the guy who was shipwrecked on a desert isle and managed to survive. Of course he was lucky—he salvaged a lot of useful equipment. But his story makes you wonder what you’d do if the same thing happened to you. Have you ever thought what you’d like to have if you found yourself all alone in a wilderness with no chance of escape? So let’s make the problem easier—you can choose just one item, one “tool,” to take with you. Interlocking the Trestles on a Single Lock Bridge! Only one tool? Impossible, you may think. The guys who have this merit badge would be very likely to choose rope. For with it anyone skilled in the outdoor arts of pioneering can build many useful things. It’s one of the oldest tools we know. Thousands of years ago, primitive men twisted vines or plant fibers to make rope that they used to attach handles to their simple tools. 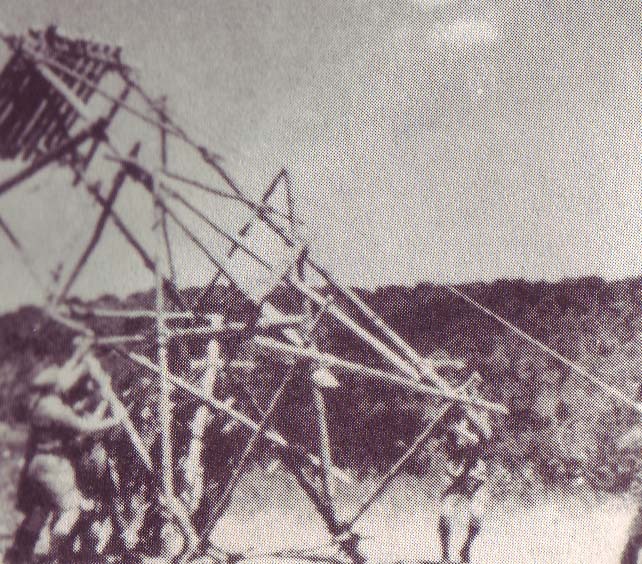 Ropes were used in building the pyramids. Lashing on Walkway Cross Spars! In Central and South America, Indian tribes were crossing deep valleys on rope suspension bridges long before the first explorers arrived from Europe. 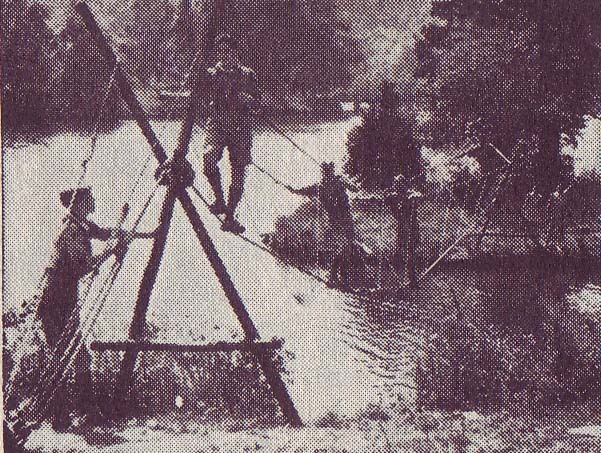 And with the help of rope our own pioneers could, when they had to, build a temporary bridge that would enable woman and children to cross a stream safely. They could build a raft to carry a winter’s catch of fur to market. Take a look at this pamphlet, and you’ll discover why rope would be a good “tool” to have in the wilderness. Everyone of the requirements depends on rope. 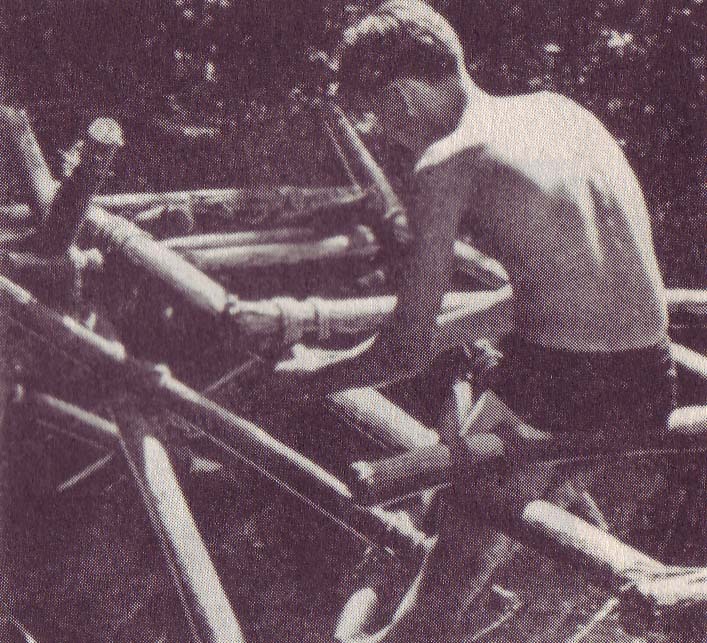 Pioneering, in the Scout sense, means being able to construct a great variety of things with poles and rope. In order to build a bridge without nails or a tower without bolts, the builder needs ropes—plus the knowledge of how to use them. Most pioneering is concerned with lashing poles together to make something—usually temporary—that makes living in the outdoors a little easier. 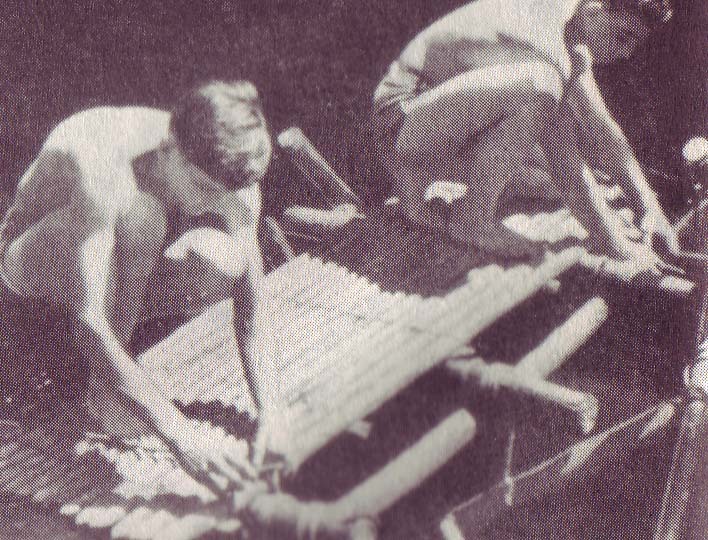 In pioneering, the use of knots and lashings is of supreme importance. A wrong knot, an insecure lashing, or a weak rope could lead to disaster. Did you know, for example, that tying a Bowline in a rope cuts its efficiency by 40%? And that a Square Knot reduces the rope’s efficiency by 50%? Which means that it’s only half as strong as an unknotted rope. Knots, turns, and hitches weaken a rope by forming a bend that distributes the load on the fibers unequally. Lashing on Walkway Floor Spars. All this knowledge comes in handy in pioneering—but our wilderness has shrunk so much that the average troop no longer can go into the woods and cut the trees needed for building a rope-lashed tower. However, there are isolated areas where Scouts might get permission to clear out some trees, and the thinning might make the ones left standing grow better. 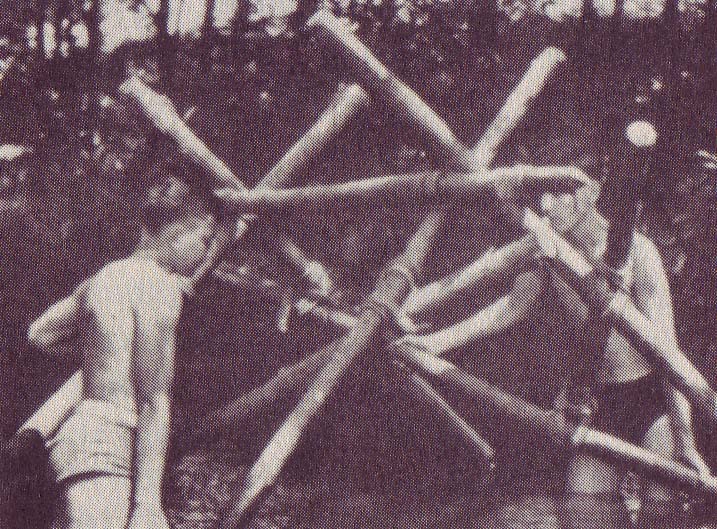 A troop that can acquire poles this way should keep them perhaps on a campsite—and use them over and over. 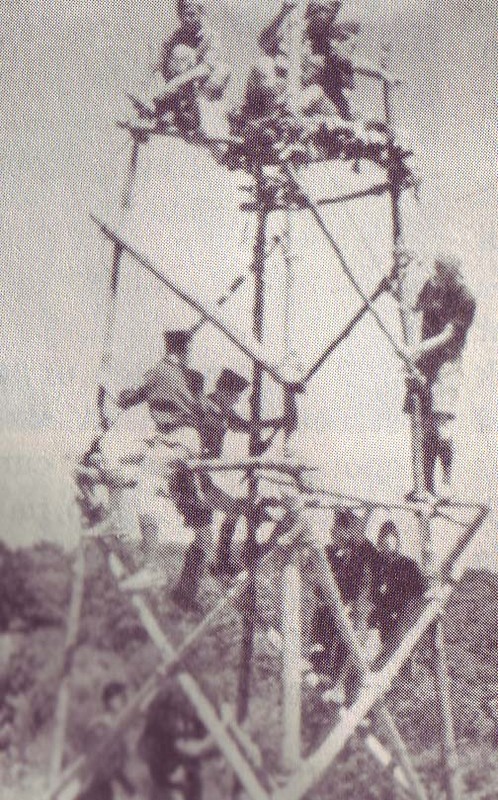 Lashing Together a 24′ Signal Tower Side! Most often the best bet for anyone who wants to learn pioneering is summer camp. Here there will be the poles, the ropes, and—just as important—someone with the skills to teach you how to make Square Lashings, Diagonal Lashings, and Shear Lashings. Ever hear of a parbuckle? Can you tie the required 10 knots and explain their use? The best way to learn is by observing someone who already knows. Our pioneers were good at improvising. They had to be. Without being able to improvise they never could have settled the wilderness., built bridges and houses, and turned it into the comfortable communities we live in today. Scouts who want to try their hands at pioneering will learn to improvise—and will be using some basic engineering principles that still have plenty of applications. Hoisting a 24′ Signal Tower! For example, engineers working in mountainous areas often use rope conveyers in preference to rigid railways. The aerial cableway used in the construction of the Hoover Dam in Colorado consisted of six steel-wire ropes crossing a 1,256-foot span. The “bucket” or carriage they supported could carry 150 tones of excavated material away from the site at one time or bring in the same amount of concrete from the mixing plant. Tightening the Lashings on a 24′ Signal Tower! You need not wait until you get to summer camp to begin your own pioneering. Even in a big city, you can learn to tie the knots and find out the best applications for each. Learn how to make Eye, End, and Short splices. And learn how to make lashings by building scale models. A scale of 1 inch to 1 foot is convenient and easy to use: This means that a tower 24 feet tall will scale down to 24 inches in your model. Pioneering merit badge is not one of those required for Eagle. But in a time when most people have no understanding of what our ancestors had to know to live in the wilderness, pioneering is a cultural tie with the past, an emergency skill worth learning, and a real test of your cooperative spirit. 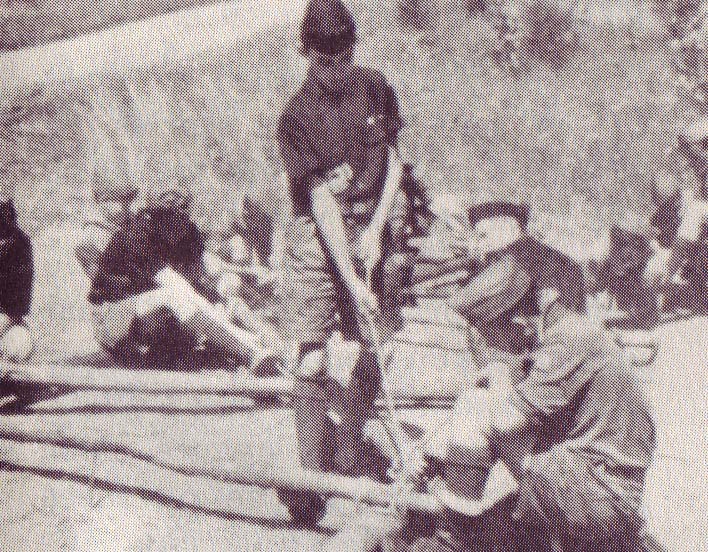 The patrol or troop has to work together as a team, and learning the give-and-take in carrying out a construction project is as important as learning the technical skills of pioneering.